Bell Shaped Sacred Powder image of the Great Luang Por Kasem Khemago Bhikkhu of Sussaan Pra Trailaks in Lampang. Released in the year 2534 Be in commemoration of Luang Por Kasem's 80th Birthday. The front face of the amulet bears the Cameo of Luang Por Kasem Khemago as he was in later years, framed within a decorative oval window. The exterior of the amulet is shaped in the form of a bell. The Khom Agkhara letter NA is embossed on the top of the front face to invoke Metta Mahaniyom Mercy Charm and Klaew Klaad Protective Influence. On the base of the front face are the words 'Luang Por Kasem Khemago' embossed. Made from finest sacred powders, and recieved empowerment by Luang Por Kasem. LP Kasem is considered one of Thailands Great Arahants, for which his empowerment of amulets is considered to be of Miracle properties. 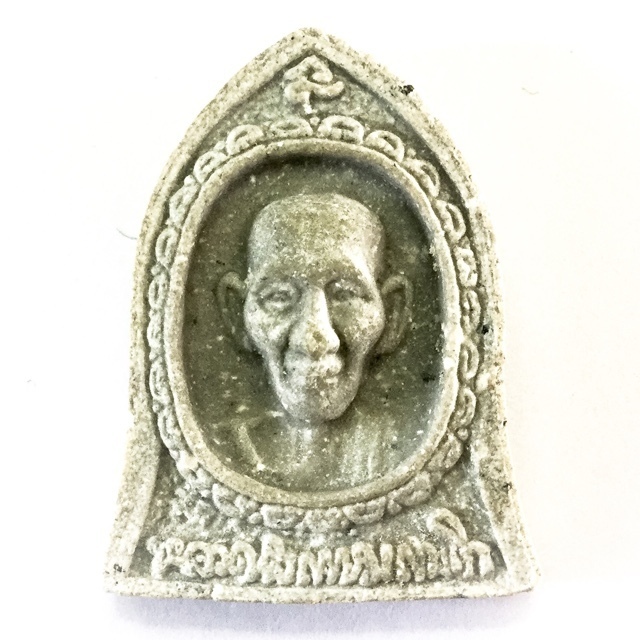 Those who revere Luang Por Kasem will need no telling about the special magical properties attributed to LP Kasem amulets. The powerof Luang Por Kasem Khemago's amulets to protect from deadly accidents is legendary, and there is not a single edition that is not highly preferred. Every single edition every made or blessed by this great Thai Arahant master is considered a highly sacred artifact, and are extremely sought after by devotees and collectors alike. One could say that you can't go wrong choosing an amulet of Luang Por Kasem Khemago, for indeed, all of his amulets are sacred classics, and eternally belonging to the Pra Niyom category status. This great Deceased Master Monk was a high Arya Sangha, of National Importance and Status, a Great Tudong Master. LP Kasem was one of North Thailands Greatest Amulet Makers – Revered even by members of the Thai Royal Family. His purity and renunciation is legendary, as are his Sacred Amulets which have spurred many a tale of Miraculous Events. Tan Khemago Bhikkhu (Luang Phu Kasem, or, Luang Por Kasem, Khemago), is an extremely revered monk of the Lanna tradition who the is considered one of the greatest Ajarn of modern Thai history, and has a massive and devoted following in the North of Thailand (and indeed all over the country). His devotees believe that to pay reverence to him or wear his amulets, results in receiving protection and safety wherever they go. His amazing dedication to his practice and purity is common knowledge with Thai people, which is easy to see since the very beginning of his path as he gave up the title of abbot of the temple and went to practice Vipassana Kammathana forest tradition methods residing in an old cemetery in the forest on a mountain side, which is where he remained practicing in humility and simplicity to the end of his mortal days. He attained an extremely high level of ability in the psychic regions and was able to empower amulets with massive power. His amulets (including Monk Coins with his image) have been the source of many a tale of miracle events, and are extremely sought after and revered by Thai people of the Central, Northeastern and especially the Northern areas. It is a known fact that he was not even attached to his food, and that it was seen that the food he was offered as alms often simply went putrid and was not eaten. He only ate to keep his body alive, but never for pleasure or mental need. Luang Por would always receive any offerings in his Badtr (alms bowl) and then ‘Phae Metta’ (send Metta offerings back) to the people. Tan Luang Por Kasem Khemago was a good Bhikkhu with Pure heart and Sila (Moral Precepts/Virtue), and was full of Dhamma, living the Dhamma as it arose, stood fast and then faded away in the sequence of Tilakkhana as expounded to be the nature of all things (Anicca – Impermanence, Dhukkha – Unsatisfactoriness, and Anatta – Non-Self). It is said that Luang Por has done away with all his Kilesas, and is full of the Baramee (Ten Perfections), and is to this day the source of well being and confidence of those who revere him, wear his amulets, and follow his teachings, and example of a good practitioner of the Dhamma, and a good Savaka (disciple) of the Lord Buddha. His Dtamra of amulets is indeed vast in the number of different models and editions, but almost all of them have recieved the attention and documentation of academics, and been highly authenticated and easily valued because of their ease of study, due to sufficient documentation, making his amulets highly preferred by serious collectors. His amulets are hence most importantly above the collectibility facto, amongst the most Sacred and Holy amulets that a Devotee could desire to possess and Bucha, for the Highest Buddhist Blessings. Luang Por Kasem's amulets are a Classic and Highly Documented (and collected) 'Dtamra' of the high end collector circles as well as highly collected by Buddhist of religious faith and followers of the Patipata of this Great Monk and Dhamma practitioner, whose selfless renunciation is tantamount to Miraculous. Books are the source of knowledge, and are thus sacred. Luang por Kasem was a great lover of books, and would restore or clean any ripped pages or discarded pieces of book.